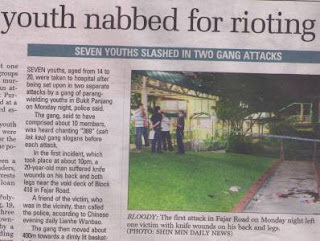 The two recent gang fights in two different locations one after another leaving one dead and many injured was a shocking jolt to many parents, society and the law enforcers of Singapore. What is becoming of the youth in our society? Actually there are signs of such troubles brewing. Is it blind to the law enforcers/ parents/ teachers that these youth are gathering in groups in HDB’s void decks, shopping centers and places of entertainment i.e disco, bars, etc? You can tell that they are young and most of them are teens to the early twenties. These youth, do they know what they have signed themselves in when they joined a triad? What is the future? Do they know they will be in trouble with the law? What sufferings they are getting themselves into and what heartache to parents and siblings? Are parents blind to the fact that their child joined a triad? Does school allowed school children showing off their tattoo body, arms and legs? Where are the disciplinarians? I am sure there are school bullies and many are forced into joining a group or a gang. There are boys and I am sure there are girls as well. Do we have to wait for them to kill someone openly to know that we are in trouble? The gang fight that lead to one death and it is for a very trivial reason. Just because someone looked at you and it is called staring? I would also stare and take a second look if someone have tattoo over their arms and legs? What are these youth trying to show off? That they are into brotherhood, that they have backing, that they can talk loudly and shamelessly opened their mouth to vulgarities? They have the 'I dare you attitude' and of course oblivious to people around. People shun them BUT they mistook people are afraid of them. So it makes them even more fearless and in their eyes, they see no one but themselves. It is a false sense security because what do they know about the world? They ignore the law and when they get into trouble with it, I am sure they shake in their pants! To chop someone up and showed a V sign is COOL? The best part, they shouted the Triads Number 369. Who is 369? They are GOD? NO! because the law do not fear them. It is live and lets live and you don't give me trouble, I close one eye to all the bad things you are doing. From loan sharks, brothels, gambling dents, drugs, gang fights and all these cannot come into the surface. Anything that cannot come into surface is against the law. So now they are really brothers in brotherhood because once they are found guilty, they will die by the gallow. They are so young. Youth and it is be beginning of life. So with stupidity, they have no tomorrow. I cannot understand why triads need to recruit such young people. Why must such activities starts in school? I am sure triads should be more sophisticated because I am sure there are better educated ones but can they lead to a better course instead of all these killings and chopping? 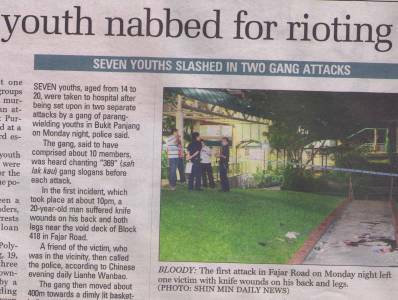 Singapore is against the citizen owning fire arms so these youth used chopper, long knives, baseball bats which should be used for better things. Looking at these youth, who is at fault? The parents, the teacher, the society and complacent law enforcer. I am really sorry for the boy who died and his parents too. I will not say forgive because to err is human and therefore the lessons must be learnt the hard way. To those who were so high, so garang and happily chopping people - you started the cause and now the effect. To live in constant fear of death is a cruel punishment because they are so young. I have no words for their parents and they know what they have breed. 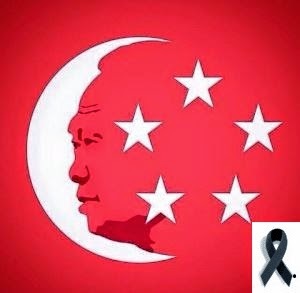 To the law enforcers, please protect the future of Singapore. Their protection got to start when they are in school, not until they became wayward and chopped people to run after them. The one being chopped and the choppers are both pathetic. Will this lesson be learned?